Financial Planning – Inflation and You. Seniors Beware. Hi everyone! This is Kyle Davis with Integrity Financial Group. We are an independent financial planning firm in Orlando, FL. Let’s talk about Inflation. In short…it’s a silent killer. Let me ask you a question. You would be upset if the government taxed 100% of your investment gains, wouldn’t you? If the tax was 0%, you’d be elated! It might not matter. I’ll explain. Let’s look at a 3% CD in the photo below. This is all about the REAL buying power of dollars, and not just the numbers on the page. 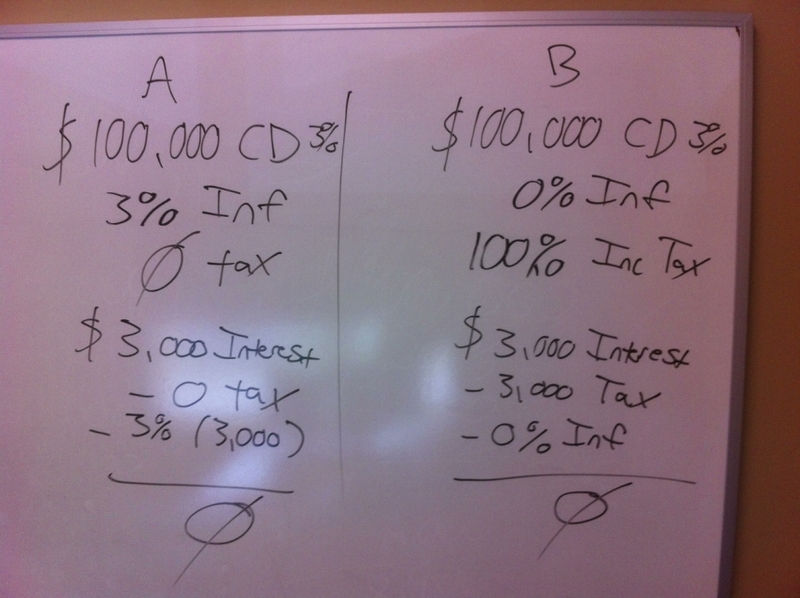 Column A invested 100,000 in a 3% CD for a year at a time of 3% inflation. They paid no tax. That’s $3,000 interest, but because of the 3% inflation, the spending power of those $3,000 is a complete wash. Inflation is eating away ALL of your investment gains RIGHT NOW, and you don’t see it on any statement…anywhere. Column B invested 100,000 in a 3% CD for a year at a time of 0% inflation. They were taxed 100% on their gains. They would be VERY angry, but at the end of the day, in a 0% inflationary year, their purchasing power would be exactly the same as Column A. Seniors and others on fixed income are affected the most. You CAN protect yourself against this. Enlist the help of a financial advisor, but be aware there are FEW solutions that can counteract inflation effectively. It is in the Fed’s best interest to create inflation, which they are doing. I can prove this.